Top row L to R: Max C snowflake from ASOS, Black Snowflake from H&M, Christmas Reindeers from River Island. Bottom row L to R: Polar Bear from Asda, Understated in blue, white and red from Tesco, Snowmen from Vardagen via Etsy. The Christmas Jumper has been seeing a revival over the last few years. Gone are the days of worrying about getting a Mr Darcy rudolph jumper, as sometimes the tackier the better! and, don't even get me started on onesies, but they seem to be in on the act too! I was looking around at the Jumpers as I was going to take part in Save the Children's Christmas Jumper Day, last Friday (what a way to jazz up Friday the 13th!). 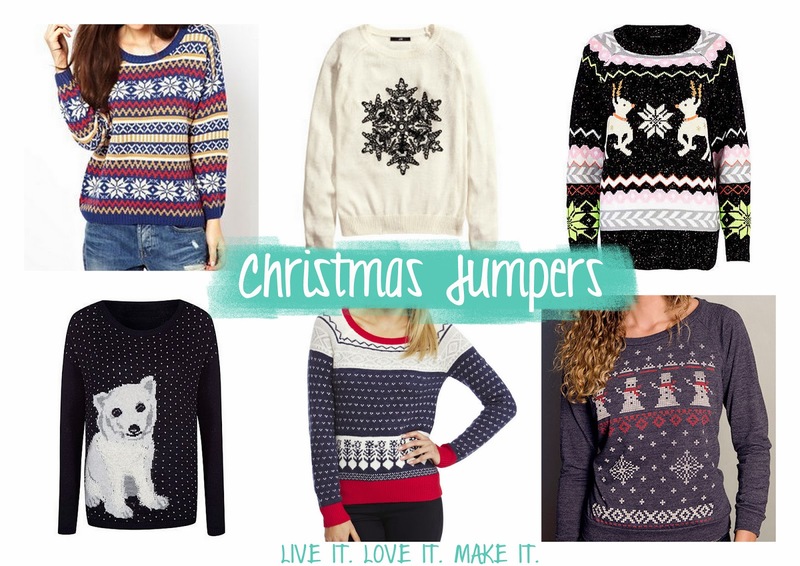 The ones above were a few of my favourites and so I thought I would share them with you guys for all your jumper needs. In the end I decided to give the money I would have spent on getting a new jumper to Save the Children, rather than buying a jumper I didn't really need and only donating £1, I thought I would donate more, go me. Those who did join in though looked amazing, you can check out the site here for a snapshot of what was worn and if everyone who did it donated £1, then I think Save the Children did very very well. I love donating to Charity at Christmas as a very worthy cause gets some extra cash and I do get the feel good factor myself. My family and I do small gifts and then give to charity and so every year I look at a different charity, whether that be home or away. What's your favourite feel good factor about Christmas? I know people who help at Shelter and Crisis every year and I used to run an event for older people who would normally be on there own on Christmas Day, which without the volunteers really wouldn't have happened, so there is plenty of feel good factor out there too.